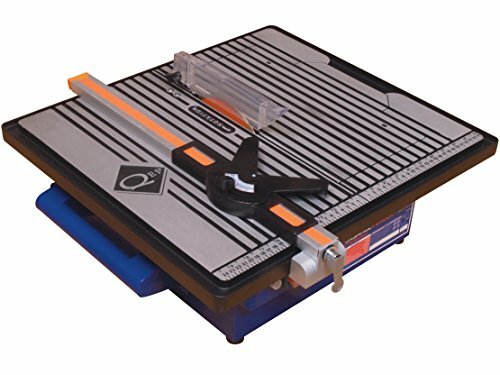 Extra large cast aluminium cutting table, with integral ruler and quick lock aluminium rip guide. Tables tilt for 15° , 30° and 45° mitres. Vitrex 10 3421 Versatile Power Pro 750 Wet Saw 110 Volt VIT103421This mains powered wet tile saw has a direct drive system with a quiet induction motor which produces a constant cutting speed for ultra smooth cuts, water cooling system with large reservoirs, and is fitted with a diamond blade with continuous rim for extra clean cuts. The extra large cast aluminium cutting table is ideal for supporting oversize tiles. It has an integral ruler and quick lock aluminium rip guide for perfect straight cuts, fully adjustable mitre guide with unique ratchet mechanism and the tables tilt for 15Â° , 30Â° and 45Â° mitres. The 180 mm blade cuts wall and floor tiles up to 25 mm thick, 17 mm at 45Â° . Suitable for porcelain, ceramic, granite, natural stone and marble tiles.